In Avatar: The Last Airbender, the world is divided into four nations: the Water Tribe, the Earth Kingdom, the Fire Nation, and the Air Nomads. Some of the people born into the Water, Earth or Fire nations will be born with the ability to bend their respective element. Others will not have this ability. The Air Nomads are the only exception to this rule. Every Air Nomad that is born is an airbender. Many people who are not born with the ability to bend choose to train under a master to become a weapons specialist. These weapons include swords, razor blades, fans, duel swords, knives, flails, and boomerangs. Others learn how to fight using nothing but their hands and their wit. Being a bender is particularly cool because it allows the characters to be more in touch with the element that defines their respective nations. While being a bender in each nation has its advantages, there are also downsides to consider. This post will explore the pros and cons of being a bender in each of the four nations. Waterbenders: Waterbenders have the ability to control water in all its forms. They can turn liquid water into ice, ice into liquid water, and liquid water into steam. An experienced waterbender can become resourceful enough to bend the water out of plants, pull the water out of thin air, or use her own sweat for waterbending. Some of them can even use their powers for healing. They can use large amounts of snow or water to lift themselves into the air and use frozen shards of ice as weapons. If they spill water in the desert, they can use bending to get it back. They can also control plants by bending the water inside of them. They are highly adaptable people and when they fight, they know how to use their opponents force against them. Cons: With training and practice, waterbenders can gain a lot of cool skills. Still, their lives are not perfect. Next to the Air Nomads (who were almost completely wiped out by the Fire Nation), the Water Tribe has the smallest population of people. The majority of Water Tribe members either live in the North or South Pole. Since most able-bodied waterbenders in the Southern Water Tribe went to fight in the war, any waterbender in the South Pole would have had virtually no access to a master to train her/him. This very thing happened to Katara until she was able to find a master in the north. The Southern Water Tribe was hit hard in the war. Because of this, fewer adults are around to provide food, clothing and shelter for the Tribe. They live simply, though they are very close-knit and have a lot of love for each other. In the Northern Tribe, things are different. They have more benders, which means they have larger houses made of ice. They have a more complex system of government, even having a royal family. There are more masters to teach young benders. However, for a long time, female benders are forbidden to learn. They are only allowed to use their bending for healing, at least until Katara comes along and changes things. A handful of waterbenders live in a swamp, allowing them to live an alternative lifestyle while remaining close to their element. There is a lot of simplicity in this lifestyle, but it also keeps them cut off from the rest of the world. Before meeting Katara, they never knew other waterbenders existed outside the swamp. There is also a little-used technique that can only be done during the full moon, and that is blood-bending. If a waterbender is powerful enough to do this, it can lead her/him to be manipulative and to value life less. If a bender, like Katara, learns this ability, it can make her feel horrible for using such a manipulative power. Earthbenders: Earthbenders can control rocks, sand, space rocks, and sometimes metal. They can use their bending to build shelters. They are determined and do not back down. They face their problems head on. The people in the Earth Kingdom are courageous and strong, and they can get through anything as long as they have hope. There are a lot of people in the Earth Kingdom, and they are always there to support the people they love. They are known for their bravery. 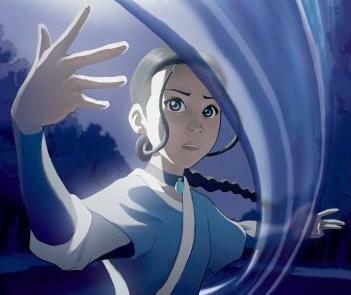 Children in the Water Tribe, like Katara, were told bedtime stories about courageous Earthbenders who fought in the war. Their strength is a part of who they are. Cons: The Earth Kingdom became heavily colonized by the Fire Nation during the war. Many Earth Benders were imprisoned. A focus on survival and self-preservation led many prisoners to just comply and stop fighting. But with encouragement from Katara, many benders were inspired to fight again. Many people in the Earth Kingdom do not have a lot of food or money. They have to use their resources wisely. Firebenders: Firebenders can control fire. Not only can they control it, but they are the only benders who can create their element as well. Some can even create lightning. Through a special technique, firebenders can also redirect lightning by guiding in, down, up, and out of their bodies. This technique is quite dangerous because the lightning must not touch the heart. Firebenders always have a source of heat, a fire for cooking, and a source of light. Some benders can breathe fire from their mouths. The Fire Nation is the wealthiest of the four nations. They have the best schools and the most powerful royal family in the world. They have the drive to achieve anything they want. Cons: Fire is a dangerous element. In order to learn it without hurting themselves or others accidentally, benders must practice self-control. While members of other nations tend to be close-knit, members of the Fire Nation seem to have the most strained relationships within families. If a high status member of the Fire Nation chooses to go against the Fire Lord for one reason or another, that person is at risk of being banished. Because the Fire Nation is responsible for so much damage and destruction, members of the Fire Nation are hated all over the world. This makes it difficult for banished people to find safety outside of the Fire Nation. They have to hide their Fire Nation identities in order to find a safe place to live. Air Nomads: As mentioned earlier, all Air Nomads are Airbenders. Their way of bending is all about avoiding conflict. They have a peaceful culture that teaches nomads to be detached from worldly possessions. They choose a flying Bison as their friend and life companion. They can also fly with bending by using a staff. Because of this, Air Nomads are free to, well, be nomads. They can travel the world and make friends in all the other nations. More than other benders, they find ways to use their bending simply for fun. Cons: Airbenders were almost entirely wiped out by the Fire Nation. The only remaining Airbender was Avatar Aang. Their peaceful culture meant they were not willing to put up a fight when the Fire Nation came looking for the Avatar. Air Nomads left behind a legacy of peace. Their value of peace and freedom inspired new people who were able to make the Air Temples their home to find a sense of freedom as well. Weapons Specialists: Weapons Specialists exist in all four nations. Even airbenders were able to use air swords if they wanted to. However, weapons were more likely to be used in the other three nations. Swords and other weapons are special because any person from any nation could become a master. Sokka learns how to use a sword, and even creates his own under the instruction of a master in the Fire Nation. Unlike the four elements, weapons do not require their user to be in a specific kind of environment. Those who use weapons also have many options to choose from. They are perfectly capable of fighting benders. Fighters, such as Ty Lee of the Fire Nations, fights using only her hands. She has knowledge of pressure points in the body, and can knock even the most powerful bender to her feet with a few quick, precise jabs. Cons: It’s possible that, in certain situations, weapons specialists can feel useless. Waterbenders, firebenders, airbenders, and even earthbenders can use their bending to help put out a fire or stop a volcano from destroying a village. There isn’t much a Sword Master can do in that situation, other than watch. The four nations each have qualities that make them special. They all have their strengths and their weaknesses. Each nation contributes something unique to the world, and those who can learn from all four nations can truly become wise.